“How to Play the Game of Basket Ball.” Herbert Welch, High School Bulletin, #46, Feb. 1900. Board of Education Collection, NYC Municipal Archives. “How to Play the Game of Basket Ball.” Herbert Welch, High School Bulletin, #47, Mar. 1900. Board of Education Collection, NYC Municipal Archives. The first public basketball game was played in March 1892. The sport quickly gained popularity. It had the excitement and merits of football but with less risk of injury. Plus, playing indoors meant weather was not a concern. Perhaps because of this, girls’ schools quickly adopted the game. Smith College organized the first women’s game the following winter, and women’s basketball paralleled men’s basketball perhaps uniquely in the history of sport. Initially the YMCA had helped spread the game around the United States and the world. Soldiers also loved basketball as it did not need much space or equipment and could be set up quickly. Although it started out as an indoor sport, by the nineteen teens, crude basketball courts appeared in city playgrounds. BPQ_ls_138: Soldiers playing basketball at mobilization camp for Spanish-American War, ca. 1896-1898. Note the lack of a backboard. Borough President Queens Collection, NYC Municipal Archives. Basket Ball in a Roof Playground, Report on the vacation schools and play grounds, 1899. Board of Education Collection, NYC Municipal Archives. “Basket Ball is an excellent exercise. It develops nearly every muscle of the body, and especially the lungs and the heart. It gives training in quickness of thought and execution and in the coordination of muscles. YMCA advertisement for “Basket Ball, Bowling Alleys, Baths” from 1899. Boys High School Bulletin. Board of Education Collection, NYC Municipal Archives. By April, Boys’ High School had played their first intermural game against the Mixed High School: “On Friday evening, 16, April, the Boy’s high school basket ball team played the Mixed high school team, at Dr. Savage’s gymnasium. The presence of a large number of interested spectators from both schools, including several teaches, stimulated the players on both sides to their best efforts, the result being an excellent game.” (Boys’ High School Bulletin, #6, p. 7, April 26, 1898). Boys’ High School Bulletin, #7, May 4, 1898. Board of Education Collection, NYC Municipal Archives. “The basket-ball team is the only senior team which has done anything to distinguish the school. This team, however, took part in a series of exceedingly good games at Dr. Savage’s gymnasium, many of which were won by our school. 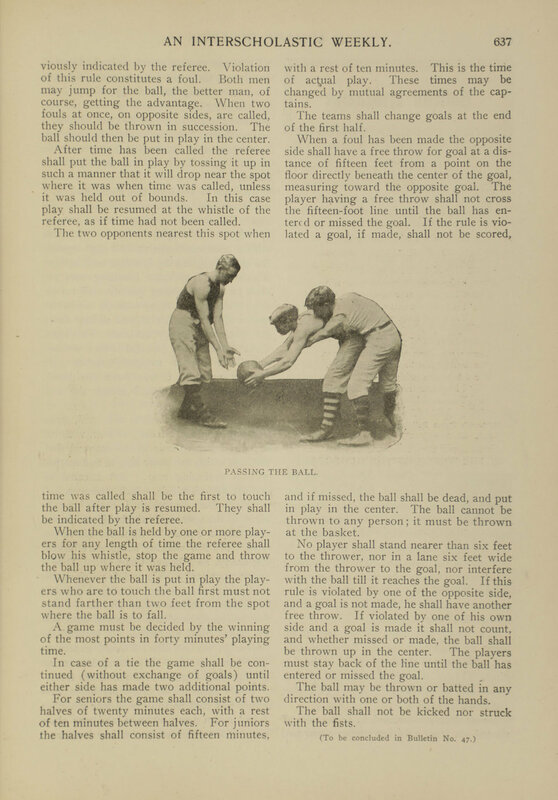 The popularity of the game is due to the fact that it affords the same amount of excitement as football, without any of the brutal elements of that game.” (Boys High School Bulletin, #11, p. 92, June 1, 1898). Boys High School Bulletin, January 18, 1899. Board of Education Collection, NYC Municipal Archives. “Basket-ball is a new game and one not yet fully appreciated; but if lovers of sport in this school will attend one or two of these contests they will be as enthusiastic over this branch of athletics as they now are over the others.” (Boys High School Bulletin, P.113, #13 November 16, 1898). That season, games were played against schools like the Business Institute of the YMCA, and the “finest game yet played by the BHS basketball team was that against the Berkeley school team on Friday evening, 6, January at Savage’s gymnasium.” (Boys High School Bulletin, #20, p. 206, January 18, 1899). In April 1899, the Bulletin became the High School Bulletin and published articles of interest to other New York City and New Jersey high schools including the Mixed High School of The Bronx, Girls’ High School of Brooklyn, the Manual Training High School, Erasmus Hall High School of Brooklyn, and the Jersey City High School. The Boys and co-ed schools also formed the Metropolitan Athletic League and it was decided that the Bulletin would be the official publication of that league. In the November 16, 1899 Bulletin, it was noted that “the Manual Training High School athletic association appropriated $20 for the girls’ basketball team… The basketball teams are unable to practice in the armory, on account of the fair which is being held there.” (High School Bulletin, #38, p.482). “.… It was developed that the Mixed high school does not favor interscholastic games for girls, on the ground that girls are too excitable and nervous to stand the strain of playing in such contests without injury. All the representatives of other schools were enthusiastic on the opposite side of the question. They argued that such games… instead of being harmful, are most beneficial, teaching self-control, self-reliance, alertness, and fearlessness, qualities which the modern girl needs…. As a result of the meeting it was decided to form the Girls’ Interscholastic Athletic Association of the Metropolitan District.” (High School Bulletin, #39, p.493-494, November 23, 1899). Four Members of the Jersey City High School Basket Ball Team, High School Bulletin, No. 46, Feb. 1900. Board of Education Collection, NYC Municipal Archives. The game ended with a win by Manual, 6-4, despite the “very inadequate practice they have had for a month past and the fact that they had never played till this year….” (High School Bulletin, #39, p. 521, November 23, 1899). “The Jersey City girls created something of a sensation as they marched on the floor of the gymnasium, clad in bloomer costume, with sailor blouses, red trimmings, black stockings and black shoes, but even the staid Flushing folk said they were decidedly neat. The Flushing girls wore white shirt waists and cloth bicycle skirts to the ankles.” (High School Bulletin, #44, P. 598, January 18, 1900). Basketball Champions, Girls’ Interscholastic Athletic League, Manual Training High School, Brooklyn. High School Bulletin, No. 49, March 1900. Board of Education Collection, NYC Municipal Archives. It was the girls’ team of Manual Training High School that would come to dominate the league that first year, despite the fact that in the fall only two girls in the school had any idea of the game. When their teacher Mrs. Ida Clark reintroduced basketball to the school (an earlier team had fizzled out) she discovered that what they lacked in skill they made up for in an enthusiastic spirit of play, “although the dictums of social decorum forbade the expression.” When these girls, being trained for a life of labor, were offered the chance away from the drudgery of their studies, many joined the team. Their coach William Powell crafted a winning team by teaching them the same as he would a boys’ team, with “no fooling, no coddling, no babyishness.” They would win the 1900 championship season, 6 games to 0. And at the end of the season the girls’ league was considered such a success that discussions were started of having a tennis tournament. From these fledgling beginnings in the City’s schools and playgrounds, basketball at the Public School Athletic League thrived. Today schools like Lincoln High School, South Shore High School and Murry Bergtraum High School for Business Careers dominate the game and continue the tradition of offering students opportunities to play and excel. BOE_72020 PS 62 Manhattan, Basketball court, ca. 1908. Note the size of the recently introduced backboard. Board of Education Collection, NYC Municipal Archives. BPS_iii_1812: Manhattan Bridge view showing play grounds and park at Cherry Street looking northwest, May 29, 1917. Photo by Eugene de Salignac, Department of Bridges, Plant and Structures Collection, NYC Municipal Archives. BPS_07088: Basketball team Municipal Building, March 4, 1922. Photo by Eugene de Salignac, Department of Bridges, Plant and Structures Collection, NYC Municipal Archives. BPS_07079: Basketball Team, taken on roof of Municipal Building, March 2, 1922. Photo by Eugene de Salignac, Department of Bridges, Plant and Structures Collection, NYC Municipal Archives. DPC_1424: Kings County Hospital: Nurses' basketball team posing for camera wearing their uniforms, ca. 1920. Department of Public Charities Collection, NYC Municipal Archives. Dpc_0388: Special Education Gymnastics class, Randall’s Island, ca. 1930. Department of Public Charities Collection, NYC Municipal Archives. WPA_682a: Playground Basketball, 68th Street and 1st Avenue, New York City, May 21, 1938. Photo by E.M. Bofinger, WPA Federal Writers’ Project Collection, NYC Municipal Archives. NYPD_d_0032f: Police Department practice game at the Metropolitan Life Insurance gym, March 7, 1939. NYPD Photo Collection, NYC Municipal Archives. DPR_24008: Basketball tournament Betsy Head at McCarren Park Playground. Coach Caral Deimling, Margaret Hylend, Roseanna Brica, Jean Percella, Theresa McGuire, Ann Bousson, Theresalinn Vaccaro, Estell Kestenbaum, March 9, 1945. Department of Parks and Recreation Collection, NYC Municipal Archives. FHL_0772: Children playing Basketball, Catholic Youth Organization, Heckscher Camp, September 1942. Mayor LaGuardia Collection, NYC Municipal Archives. DPR_19876: Abraham Lincoln High School Playground, March 27, 1941. Department of Parks and Recreation Collection, NYC Municipal Archives.